This product was replaced by a updated version GPRS Shield V2.0 (SLD01098P). The GPRS (General Packet Radio Service) Shield is a new nonvoice value added service that delivers GSM/GPRS 850/900/1800/1900MHz performance for voice, SMS, Data, and Fax in a small form factor and with low power consumption. It is controlled via AT commands (GSM 07.07 ,07.05 and SIMCOM enhanced AT Commands), and fully compatible with Seeeduino/Arduino and Mega. 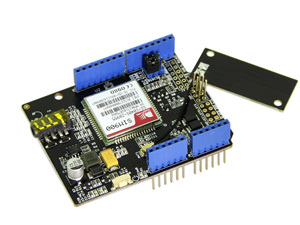 The GPRS Shield has 12 GPIOs 2 PWMs and 1 ADC(They are all 2V8 logic).